Climate change is a well-known problem resulting from the burning of fossil fuels and the subsequent release of carbon dioxide (CO2) into the atmosphere. But a separate, lesser-known problem resulting from increased CO2 emissions is that the world’s oceans are becoming more acidic — raising concerns about the ability of certain organisms to survive in that altered environment and about the overall health of the oceans. The problem is so pressing that an international group of scientists has banded together to help educate the public about “ocean acidification,” the scientific details of which are intricate and sometimes counterintuitive. Twenty-seven scientists from five countries worked together to produce and distribute a document to provide accessible and accurate answers to the most commonly asked questions about this growing problem. Ocean acidification is a relatively new field of research, with most of the studies having been conducted over the last decade. While it is gaining some attention among policy makers and international leaders, the scientists find there is still a lack of understanding in the public. “We realized the messages citizens were getting about the science weren’t clear enough,” says Sarah Cooley, a post-doctoral investigator at WHOI, which is home to the OCB program office. A short email sent from the OCB program office to scientists around the world yielded a consensus that more education was necessary. “Everyone we contacted felt there was a need to do this. We decided to sketch out a list of questions we’ve all heard or we think might be asked,” Cooley adds. Working by email, the group of scientists agreed on a set of 39 questions and established a process to develop clear and accurate answers that could be understood by a lay audience. All the answers were put back out to the scientific community for open peer-review, revision, and approval. WHOI scientists Anne Cohen, Dan McCorkle, and Michael Holcomb participated in the project by writing and reviewing material. The document will be published on the OCB’s ocean acidification Web site as well as the European Project on Ocean Acidification (EPOCA) Web site. EPOCA is funded by the European Union with the goal to facilitate research, promote collaboration, and to undertake outreach efforts to distribute research results. The list will be revised periodically and maintained at www.whoi.edu/OCB-OA/FAQs and www.epoca-project.eu/index.php/FAQ.html. 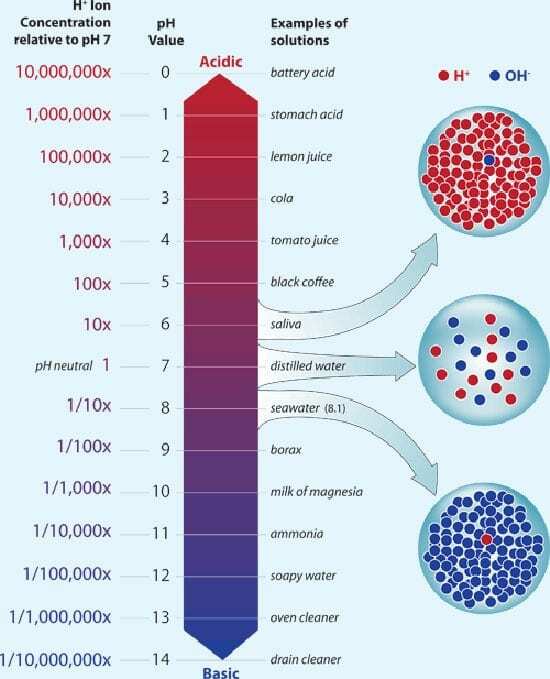 A small drop in pH means big change in acidity: The pH of seawater is near 8, which makes it mildly alkaline, or basic; but any decrease in the pH of a liquid is considered “acidification.” The key danger factor is an increase in dissolved hydrogen ions. The U.S. 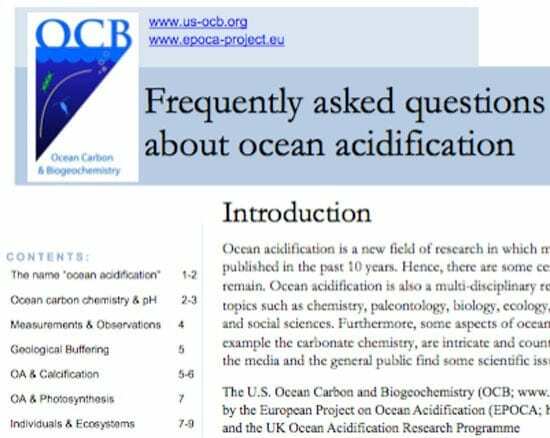 Ocean Carbon and Biogeochemistry (OCB) program, supported by the European Project on Ocean Acidification (EPOCA) and the UK Ocean Acidification Research Programme, has compiled a list of 39 frequently asked questions (FAQs). In total, 27 scientists from 19 institutions and 5 countries contributed to the document. The FAQs can be viewed on the OCB’s ocean acidification Web site, as well as downloaded as a pdf.